Most people are probably convinced that when we breathe through our nose, we are breathing through both nostrils at the same time, though this is not entirely true. In reality, when we are sleeping, our nasal breathing is controlled by a process known as the nasal cycle, which alternates breathing from primarily one nostril to the other for a period of two to three hours at a time. To show the full effect, try to plug one nostril and breathe in through the other while looking in a mirror. You will soon see that when breathing in, the nostril slightly collapses or closes itself due to the effect of trying to force air through it. This same effect is precisely what happens when we breathe through one nostril while sleeping due to the nasal cycle. So you may be asking yourself what this has to do with snoring. Well, the answer is quite simple. When we sleep and cannot get enough oxygen in through our nostrils due to their constant collapsing on the in-breath, our body automatically switches to mouth breathing to provide the required oxygen to the bloodstream, which results in increased snoring, especially if we happen to be sleeping on our back. 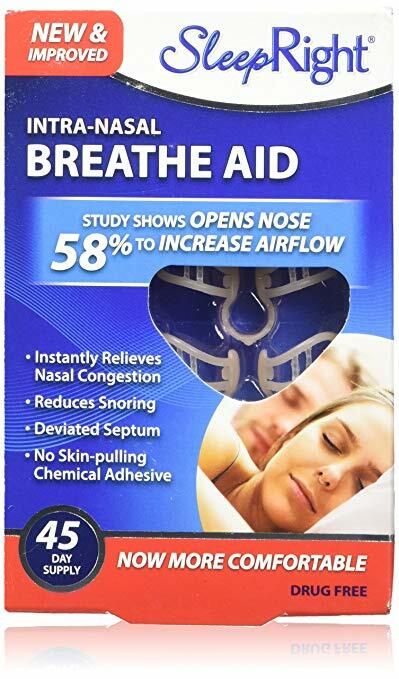 This is also precisely why nasal dilators are so useful at stopping snoring because they allow us to breathe freely through our nostrils by ensuring that they remain fully open. If you snore due to constricted nasal passages, then an anti-snoring device such as this might just be the perfect solution for you. Nonetheless, it probably goes without saying that it may take some time to get used to sleeping with a device shoved into each nostril. Still, the best products on the market are made from soft, medical grade silicone which shouldn’t be too uncomfortable, and most people get used to sleeping with the device within a few nights. However, if you find that this type of device works to reduce or eliminate your snoring, you should know that this is not a temporary fix. It will be necessary for you to sleep with the device inside your nose every night for the rest of your life if you wish to continue not snoring, but most prefer this to keeping their partner awake every night with their incessant snoring. When choosing this type of anti-snoring device, there are a few things to pay attention to. The first is that each person’s nostrils are of a different size and shape, which is why most products are available in multiple sizes, so it may be necessary to try out a few sizes to find the one which fits your nostrils best. Another thing to consider is the material that the dilator is made of. You should steer clear of any dilators made from plastic or rubber, and instead only choose one made of surgical grade silicone, as these are easiest to keep clean and free from bacteria, plus the most comfortable to wear. To make your choice easier, below we have presented two different products which are sure to work for most. Are you tired of insomnia? Your spouse snoring every night and you want to get rid of snore? This product is designed to solve your problem as simply as possible! This anti-snore nasal dilators are gently placed in the nostrils to immediately improve the flow of air through your nose. Airflow prevents the vibration of the soft palate, which allows you to breathe easily and eliminate snoring without discomfort to the user. ATTENTION: for people with allergic diseases it is possible to use only with the permission of the doctor. 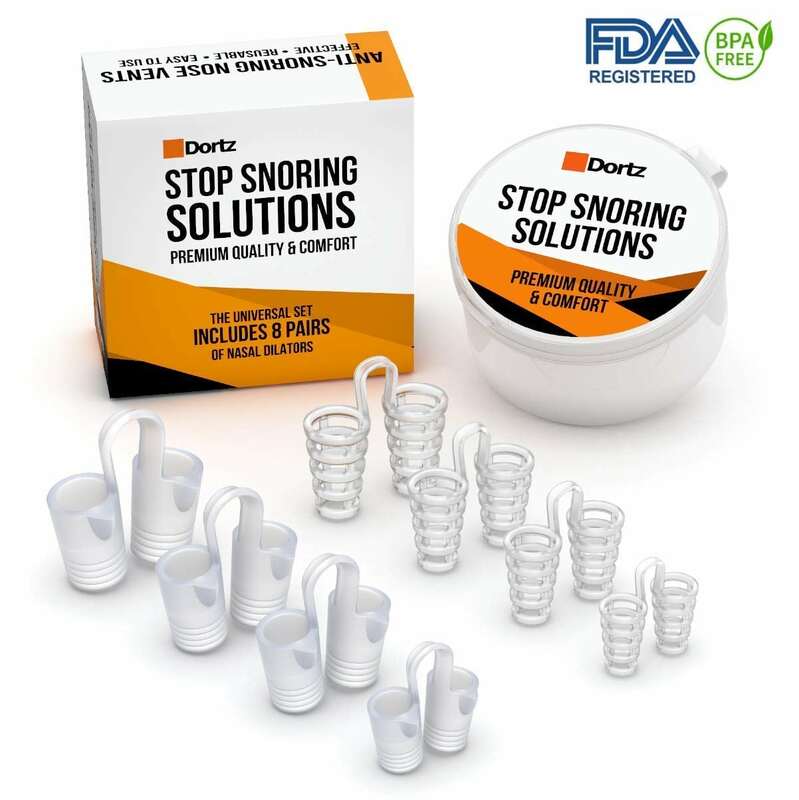 EASY BREATHING: The best otolaryngologists have developed this snore stopper kit, which allows you and your loved ones to stop snoring and breathe better through your nose as you sleep. SET of 8 pairs + TRAVEL CASE: Each package includes 8 pairs of anti snoring nasal vents. Two different types in 4 sizes. Snoring solution includes a convenient storage case. DURABILITY and REUSABILITY: Thanks to the use of high-quality materials and antibacterial case, you can use our nose vents for a long time. Nasal dilators are comfortable and easy to use and clean. SATISFACTION GUARANTEE: Dortz highly appreciate your gratitude and trust. They are sure that this snore stopper set will solve your problems. Dortz is committed to providing the best customer service possible. WORKS INSTANTLY. From the moment you put it in, this nasal breathing aid goes to work, relieving nasal congestion and helping to reduce snoring. INCREASES AIRFLOW. The SleepRight Breathe Aid’s flexible nasal flares gently expand nasal passages, opening airways (up to 58% more) to increase airflow. REUSABLE. A single SleepRight Nasal Breathe Aid can be used for 15 days or more. COMFORTABLE. SleepRight nasal breathe aids’ flexibility enables them to comfortably fit noses of all sizes. These nasal sleep aids use no adhesive, eliminating the risk of skin blemishes or irritation. EASY TO CLEAN AND STORE. 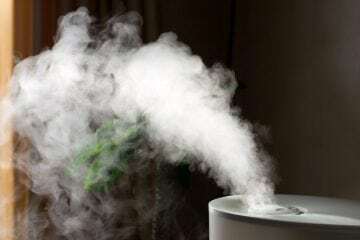 SleepRight breathe aids can be easily cleaned with mild soap and cool water as needed. They come with a reusable, recyclable case for convenient storage. WAKE UP FULL OF ENERGY TO MAKE THE MOST OF YOUR DAY after a peaceful night sleep! 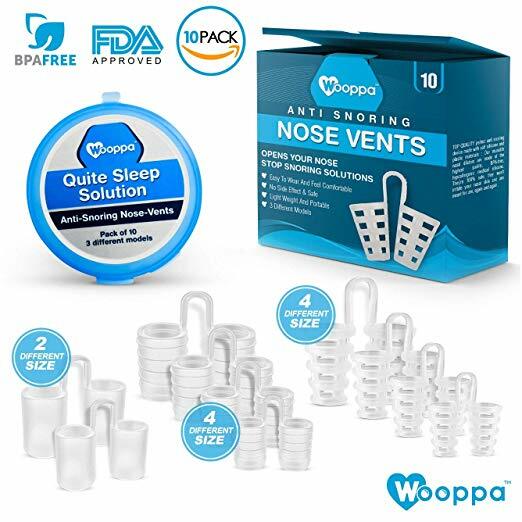 Wooppa premium 10-pack snore stopper set that will keep your nasal airways wide open to facilitate airflow, eliminate ear-splitting snoring and help you sleep like a baby. Enjoy the most restful sleep and wake up in top form for record performance in the office, the classroom or the sports! SAVE YOURSELF THE PILLOW TALK! Stop snoring and keeping your significant other awake at night, with the ultimate anti-snoring solution! The 3 sets of different model nose snore stoppers provide you with full 10 DIFFERENTLY SIZED nasal vents, to make it easier to choose the one you need. Put an end to disturbing snoring once and for all with a high-end set of 10 clear silicone nose vents! MOST COMFORTABLE SNORING STOPPER VENTS! Wooppa nasal sleep vents ensure the perfect fit in your nasal canals without slipping or falling off like many similar snore stoppers do. Gently inserted into the nostrils and easily removed, they guarantee instant snore relief without causing a speck of discomfort. 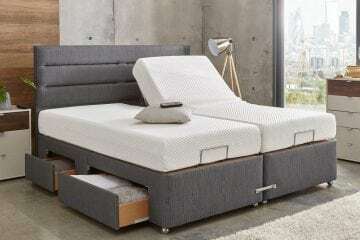 Enjoy the quality night sleep you deserve and get up bursting with positive energy! YOUR HEALTH IS OUR TOP NOTCH! No more doubtful manufacture breathe-right vents that put your health at risk with the skin irritations they cause! Quality-crafted from food-grade silicone, BPA-approved and undergone the most stringent quality tests, Wooppa breathing vents set is absolutely healthy and safe to use for men and women of all ages. Indulge in the ultimate anti snoring solution! YOUR 100% SATISFACTION IS GUARANTEED! Wooppa take great pride in the quality and craftsmanship of snoring nose vents and they know you’ll love their efficiency! This is why Wooppa back them with 100% Money Back Guarantee, to help you place your order with confidence. To them, YOUR complete satisfaction is top priority! Memory Foam Pillows – The Magnificent 5! I’ve used mute brand nasal openers for 2 nights now. I snore like a grisly bear. 8ve never felt so rested in my life , its life changing. I’m not waking up my fiance I’m not waking up myself and I’m not waking up the dogs or neighbors lol. I used to always wake up 5 6 times a night. Last 2 night I woke up only once. These things are amazing. I would like to try some other brands but so far mute gets a 5 star from me.